These tools are necessary items to assist you in your crafting endeavours. Please check back as we add new items to the list! 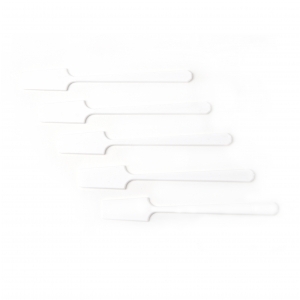 These spatulas make it a snap to scoop out melted base from your bulk lipgloss base. They are also a handy tool for blending lipgloss base with pigments. These scoops can be used to measure small quantities of pigments or lip base by volume. One scoop holds approximately 1 gram of mica, depending upon the particle size.